Calves born to dairy cows are separated from their mothers immediately after birth. The female calves are raised to replace older dairy cows in the milking herd. After three or four years of intense and stressful milk production, the females are sent to slaughter. The male calves also have a horrific fate. Since they will never produce milk, male dairy calves are of little or no value to the dairy farmer and are sent to veal farms. The veal industry is a byproduct of the dairy industry; by supporting one industry, you are inevitably supporting the other. There are over 9 million dairy cows in the U.S. Thanks to genetic manipulation and intensive production technologies, each cow produces up to 100 pounds of milk per day – ten times more than they would produce naturally. To continue producing milk, they are forced to have a calf every year; like humans, cows have a nine-month gestation period, and so giving birth every twelve months is physically demanding. Cows are artificially re-impregnated while they are still lactating from their previous birthing, so their bodies are still producing milk during seven months of their nine-month pregnancy. As a result, the cows’ bodies are under constant stress, for nothing more than humans’ desire for dairy. Further, a cow eating a normal grass diet could not produce milk at the abnormally high levels that are standard on modern dairies, so today’s dairy cows must be given high energy feeds. The unnaturally rich diet causes metabolic disorders like ketosis, which can be fatal, and laminitis, which causes lameness. The dairy industry continues to subject cows to abuses in the name of increased profit. Approximately half of the country’s dairy cows suffer from mastitis, a bacterial infection of their udders, from being constantly milked. Other diseases such as Bovine Leukemia Virus, Bovine Immunodeficiency Virus, and Johne’s disease, are also rampant in U.S. dairy cow herds. These often go unnoticed and untreated due to long incubation times. Because commercial dairy farms have such high numbers of animals, it is impossible for veterinarians to thoroughly examine each cow. Even with regular veterinary visits, ailments can often go unnoticed and untreated as vets are forced to consider “herd health” over the health of individual animals. Another dairy industry disease caused by intensive milk production is “Milk Fever.” This ailment is caused by calcium deficiency, and it occurs when milk secretion depletes calcium faster than it can be replenished in the blood. In the U.S., it is legal for farms to inject cows with Bovine Growth Hormone (BGH), a synthetic hormone, to get them to produce even more milk. Besides adversely affecting the cows’ health, BGH also increases birth defects in their calves. All dairy cows eventually end up at slaughter; both the dairy and beef industries feed into the same system. The abuse wreaked upon the bodies of female dairy cows is so intense that many of these cows become “downed.” This term refers to cows that are so sick and/or injured that they are unable to walk or even stand. Downed cows are routinely dragged or pushed with bulldozers in an attempt to move them to slaughter, even though it is illegal to process non-ambulatory animals. Dairy cows are not given any food, water, or protection from the elements for up to 28 hours during their inevitable journey to the slaughterhouse. Prior to being hung up by their back legs and bled to death, dairy cows are supposed to be rendered unconscious, as stipulated by the federal Humane Methods of Slaughter Act. However, this ‘stunning’ which is usually done by a mechanical blow to the head, is terribly imprecise. As a result, conscious cows are often hung upside down, kicking and struggling, while a slaughterhouse worker makes another attempt to render them unconscious. The animals’ throats are sliced, whether or not they are unconscious. The veal industry was created as a by-product of the dairy industry to take advantage of an abundant supply of unwanted male calves. Close to a half million male calves are raised and slaughtered for veal each year. Calves raised to make veal are severely confined. Veal calves live the entirety of their short lives in “vela crates,” wooden crates that severely restrict the calves’ movement. These crates are typically only 2.5 feet wide at most and have slatted wooden floors. Calves raised to become veal are also purposely fed an all liquid milk substitute which is deficient in iron and fiber. This insufficient diet makes the calves severely anemic in order to produce the pale colored flesh that veal-eaters prefer. Veal calves are typically slaughtered at 16 to 18 weeks of age. About 15 percent of veal calves are slaughtered at less than 3 weeks old and are classified as “bob” veal for low-grade products like hot dogs and frozen dinners. Many are unable to walk to slaughter as their muscles are severely underdeveloped. 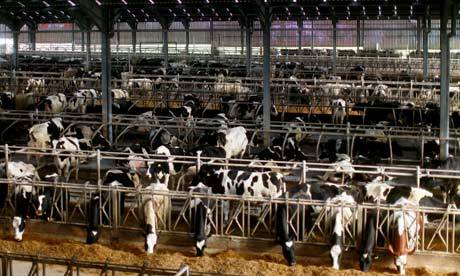 Crate confinement prevents the performance of most of a cow’s natural behaviors including locomotion, resting, sleeping, grooming, circadian rhythms, as well as digestive, reproductive, explorative, and social behavior. No straw or bedding is placed in veal crates due to a concern that they will eat the straw and ingest extra iron or fiber, which would color their meat. Calves are forced to lie on the wooden slats of their crate, covered in their excrement. They exhibit stereotypic movements, such as head tossing, head shaking, air chewing, scratching, and kicking, out of frustration and chronic stress. The confinement and insufficient diet of veal calves results in poor health and a lack of healthy growth and development. Calves raised for white veal suffer from serious digestive problems including abnormal gut development and stomach ulcerations. Research has shown that veal calves raised in crates are more susceptible to disease than calves housed in other systems, and consequently they require three times more medication and medical treatments. The European Union has banned the use of veal crates because they were determined to be inhumane. Public sentiment pressured the American Veal Association to encourage an industry-wide phase-out of veal crates, and a number of states (including Massachusetts) have passed laws banning them. However, on the federal level, it is still legal in the US to use extreme confinement methods in veal production. Many beef cattle are born and live on the range, foraging and fending for themselves for months or even years. They are not adequately protected against inclement weather, and they may die of dehydration or freeze to death. Injured, ill, or otherwise ailing animals often do not receive necessary veterinary attention. While there are humane methods of identification, such as neck chains, ear tags, and microchips, many ranchers continue to use hot iron brands. This practice is extremely traumatic and painful, and the animals bellow loudly throughout the process. Beef cattle are also subjected to ‘waddling,’ another type of identification marking. This painful procedure entails cutting chunks out of the hide that hangs under the animals’ necks. Waddling marks are supposed to be large enough so that ranchers can identify their cattle from a distance, and the procedure is performed without anesthesia. Accustomed to roaming unimpeded and unconstrained, range cattle are frightened and confused when humans come to round them up. Terrified animals are often injured, some so severely that they become “downed” (unable to walk or even stand). These downed animals commonly suffer for days without receiving food, water or veterinary care, and many die of neglect. Other downed animals are dragged and/or pushed with tractors on their way to the next horrifying phase in their lives. Here, cattle are further frightened and confused as they are goaded through a series of walkways and holding pens to be sold to the highest bidder. From the auction, older cattle may be taken directly to slaughter, or they may be taken to a feedlot. Younger animals and breeding-age cows may go back to the range. Young cattle are commonly taken to areas with cheap grazing land, to take advantage of this inexpensive feed source. Upon reaching maturity, they are trucked to a feedlot to be fattened and readied for slaughter. At feedlots, cattle are crowded by the thousands into dusty, manure-laden holding pens. The air is thick with harmful bacteria subjecting the cattle to a constant risk of respiratory infection. Feedlot cattle are routinely implanted with growth-promoting hormones, and they are fed unnaturally rich diets designed to fatten them quickly and profitably. Since cattle are biologically suited to eat a grass-based, high fiber diet, their concentrated feedlot rations contribute to metabolic disorders. As discussed above, cattle may be transported several times during their lifetimes, and they may travel hundreds or even thousands of miles during a single trip. Long journeys are very stressful on cattle and contribute to the rampant spread of disease. Many cattle die in transport to slaughter. A standard beef slaughterhouse can slaughter up to 400 cattle per hour. The high speed of the assembly line and the number of cattle killed each hour makes it difficult to ensure humane treatment. Prior to being hung up by their back legs and bled to death, cattle are supposed to be rendered unconscious, as stipulated by the federal Humane Methods of Slaughter Act. This ‘stunning’ is usually done by a mechanical blow to the head. However, as with dairy cows, the procedure is terribly imprecise and inadequate stunning is inevitable. As a result, animals are often slaughtered while they are still conscious. Though we typically refer to all cattle as cows, the term cow, in industry parlance, only applies to female cattle who are older than 30 months or who have birthed calves. Heifers are females who have not yet calved, steers are castrated males, and bulls are intact, mature males. Cattle drink 30 gallons of water and eat 100 pounds of food daily. Cattle spend approximately six hours daily eating and eight more hours chewing cud. In nature, cattle spend about 40 to 50 percent of their day lying down. Cattle tails behave like dog tails in that they tend to relay behavioral information. If the tail is hanging straight down, the animal is relaxed. If the tail is tucked between the legs, the animal may be cold, sick, or frightened. If the tail is away from the body, the animal may be mating or may feel threatened. If the tail is held out in a straight line, the animal is in a playful mood. Cattle can detect smells up to five miles away. Cattle perceive higher and lower frequencies better than humans do. Cattle possess 320-degree panoramic vision, which enables them to see in almost every direction, except directly behind them, without moving their heads. Vocalizations or “calls” can indicate several emotions including excitement, frustration, interest, pleasure or stress. Cows have complex social interactions. Researchers have discovered that traits such as intelligence, confidence, and experience help to determine who moves up the social hierarchy of a cattle group. Contrary to what some people believe, female cattle do not spontaneously produce milk. Cows only lactate when they need to feed their newborn calves. Therefore, in order to produce milk for human consumption, cows must be impregnated and then calves must be taken away from the cows shortly after birth.